CSU Stands by Prediction of Quieter Season, but Tropical Wave is Headed Toward V.I. 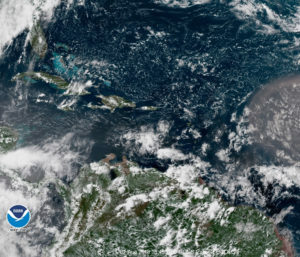 Meteorologists at Colorado State University on Thursday said they continue to stand by their forecast of a lower-than-average hurricane system, and the current forecast continues to show a quiet Atlantic for at least the next week. But a series of tropical waves, one in the Caribbean and two more off the coast of Africa, suggest that, though tropical events such as hurricanes aren’t on the near horizon, there could be some rainstorms coming soon. The closest of the tropical waves was about halfway between Anguilla and St. Croix at about 10:30 Thursday morning. Strong high pressure to the north and dry, dusty air from Africa are surpressing most of the shower activity and growth potential of the wave, so trop[ical development is not imminent, the National Hurricane Center reported. The other two tropical waves are located in the mid-Atlantic and a few hundred miles off the coast of Morocco. In a news release issued Thursday, Colorado State University hurricane researchers continue to predict a below-average Atlantic hurricane season. They cite both a cooler than normal tropical Atlantic and the potential development of a weak El Niño event as the primary reasons for the below-average prediction. The tropical Atlantic remains much colder than normal, the researchers said. A colder tropical Atlantic provides less fuel for developing tropical cyclones. Vertical wind shear was much stronger than normal across the Caribbean in July, which also tends to be associated with quieter Atlantic hurricane seasons. The CSU Tropical Meteorology Project team is predicting a total of nine additional named storms to form after Aug. 1. Of those, researchers expect three to become hurricanes and one to reach major hurricane strength (Saffir/Simpson category 3-4-5) with sustained winds of 111 miles per hour or greater, according to the CSU team. And let’s not leave out the facts that the spraying of toxic chem trails is what is causing the water to cool, as the sun is constantly blocked out, but let’s not let the real truth get in the way.